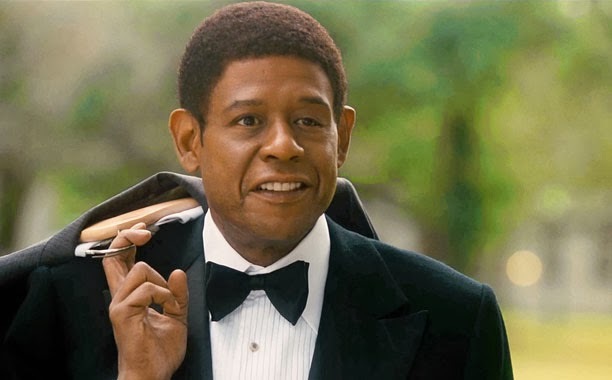 Without being entirely familiar with the story on which The Butler is based, I couldn't possibly comment on how the film deviates from the true story of Eugene Allen, an African American butler who worked at the White House for more than three decades. It doesn't surprise me at all to find out that a director like Lee Daniels has made the tale more melodramatic, but I'm not sure that lets his film down either. The film's titular butler is Cecil Gaines, who comes to the attention of White House recruiters, precisely for the reason that he draws so little attention to himself. Arriving in the Oval Office in President Eisenhower's time, he continues to work there through the administrations of Kennedy, Johnson, Nixon, Ford and Reagan, becoming privy to all kinds of discussions about civil rights policy, but never saying a word. In contrast to his professional life, his family life is more turbulent, particularly as his eldest son, Louis, gets involved in the civil rights movement. The script comes from Danny Strong, (Jonathan from Buffy The Vampire Slayer, y'all!) manages to fire off a couple of cracking one-liners- "We have no tolerance for politics at the White House", as Cecil is told in his job interview, is a particular highlight- but largely leans towards melodrama. This suits Daniels, whose previous films were Precious and The Paperboy, right down to the ground. Before you read around the more dramatic addendums to the story, it does seem like he's reined himself in this time around. Rather than amping up the shock value in domestic violence or urinating on jellyfish stings, Daniels largely lets the injustices of the Jim Crow laws, and segregation, speak for themselves, just as they should. There are no liberties taken with history that are intended solely to cloy or to get a rise out of the audience. At the very beginning, Cecil's mother is raped by a white landowner, who then shoots Cecil's father dead when he attempts to stand up for her- this never happened to Allen, but part of the melodramatic effect of the film is in how credible this backstory seems. On the other hand, in the course of letting this apocryphal but no less harrowing representation speak for itself, it's not a film that seems to have as much authorship or directorial flair as Daniels' previous work. 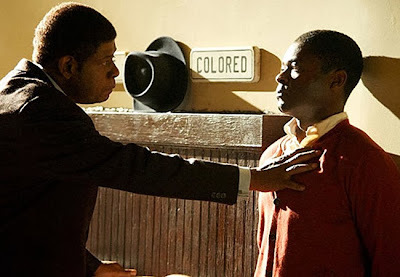 The only standout sequence from a directorial point of view comes with a sequence of Louis and his fellow civil rights campaigners having their endurance tested, first in a punishing rehearsal and then in an altogether more violent encounter at a lunch-counter sit-in, all intercut with a fancy dinner at the White House. The contrast works once, and never affects so strongly in all of the times that it's repeated after that. 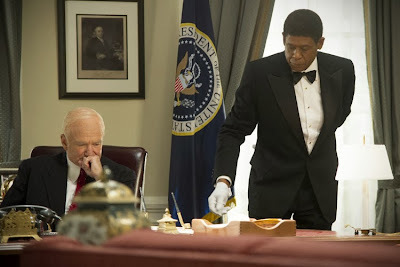 Far more of it feels grounded by Forrest Whittaker, as he serves a succession special guest stars playing US presidents, and marking the passage of history as mayflies might- none of them have more than a few scenes. Liev Schreiber's LBJ is the standout amongst these, barking orders to stave off race riots through the door of the Oval Office bathroom, while having a dump and requesting that Cecil pass him the prune juice, in a most un-presidential fashion. And yet the most surreal is still John Cusack- an early, sweaty-palmed encounter with his Nixon sends a chill through the film that might as well have come from a cameo by Emperor Palpatine, and his performance is uncannily watchable. The only constant is the tension between Cecil's professional demeanour and his personal life, but that's an inherently dramatic device all by itself. Whittaker does a terrific job of representing that turmoil- he is hired specifically for his invisibility, with his employers only coming to appreciate his skills and personality further down the line. He outwardly seems content in that status, but there's still some fire in him. That much is apparent in his brilliant scenes with David Oyelowo, as the son who seems to crave his father's approval just as much as he desires equality and freedom, and with Oprah Winfrey, who follows in Daniels' tradition of unexpectedly inspired casting choices as Cecil's wife. Arguably, The Butler needs this strong trio of performances at its centre to keep it from sprawling into incoherence. It's an ambitious and sporadically moving portrait of the African American experience in America over the course of a historical epic, with some inevitable lapses into melodrama taking the viewer out of the experience- one late tragic development is so sudden, and so immediately brushed over, it's almost funny. It might be a by-numbers biopic, embellishments and all, but it's not without a sense of quiet subversions, and some affecting insights into a period of history that is, perhaps, still looking for a definitive cinematic portrayal. The Butler is still showing in selected cinemas nationwide. If you've seen The Butler, why not share your comments below? And does anyone else deserve this year's award for Quickest Cameo Ever than Jane Fonda as Nancy Reagan?